When you first met, one of you squealed with overflowing excitement and touched the other's hand with a big grin. You napped together that afternoon, both of you with your hands above your heads (just like your Daddy.) The days and nights moved along and their rhythmic dance filled our lives with many unforgettable firsts, like the first time you felt a twinge of jealousy, Finn, when I turned my head from you to comfort Lachlan while you nursed to sleep. 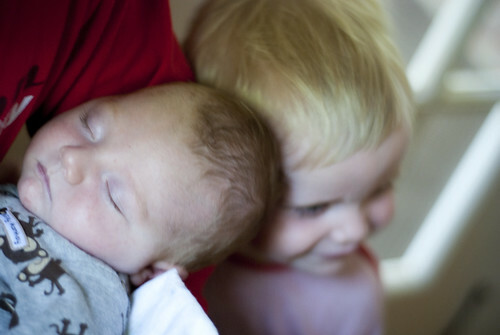 Lachlan, your first experiences of brotherhood were in the womb, as you were smooshed and poked by Finn's elbows and toes as he read books in Mama's lap. 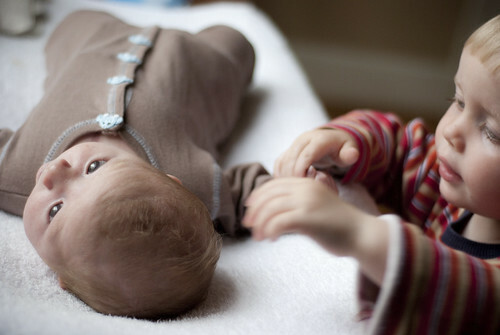 Your extra-utero experiences are not much different, although they are complimented by the fascinating visual and auditory experience that is your big brother. You gave him a big smile today, and Finn gave you one of many unsolicited smooches on your cheek. You may smoosh and poke each other on occasion, but you already feel such love, each in his own way.